Belasko is a Chimera and henchman for the Dread Doctors. His Chimera traits originate from both a werewolf and an avian shapeshifter called a garuda. His talons were specifically of a garuda and had the ability to take power from any supernatural creature. 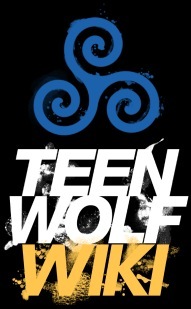 Belasko is sent by the Dread Doctors to assassinate the True Alpha werewolf Scott McCall and steal his power. Belasko is released from his incubation by an unwitting Jordan Parrish. 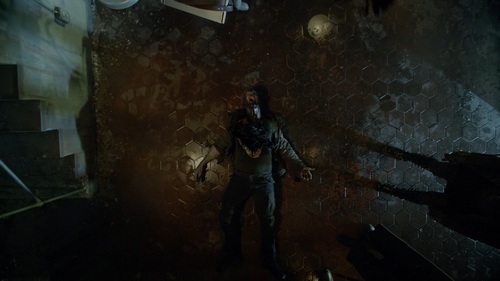 The Chimera demands Scott's location from Parrish and when the deputy refuses, he mortally wounds Parrish. He then goes on the hunt for Scott, tracking him to the high school. He strikes, then attempts to take Scott's power with his signature talons. Scott fights back and overcomes the talons, cripples Belasko, defeating him. He returns to the Dread Doctors and begs them to give him another chance to serve them. The para-scientists kill Belasko. Belasko is an immensely power-hungry and bloodthirsty individual who has no problem with killing whenever it suits his needs as seen with how he viciously beats and mauls Scott's Pack as well as Parrish. He is also very arrogant and impulsive as he lords his augmented powers over others, but cunning as he has a great understanding of how his powers worked and was an effective tracker. Underneath, Belasko is a deeply cowardly individual who does everything he's ordered to as evidenced by his fear of the Dread Doctors. As a werewolf-garuda Chimera, Belasko has a vast array of supernatural abilities. From his werewolf part, he has vast super-strength, super-speed and durability of a high level, being able to face off against multiple foes and could sneak up on and around his prey very effectively. As he was part-garuda, Belasko has an affinity with birds as his heightened power partially comes from supernatural avians. Also, Belasko is outfitted with talons specific to a garuda. These talons have the ability to steal power from potentially any supernatural creature. At 2218 Astoria Lane in Beacon Hills, the Dread Doctors have planted Belasko inside the house they're using to store their transforming Chimeras. Deputy Parrish investigates the noises. He comes down into the basement level. He hears Belasko thumping against the stone wall and assumes someone is trapped behind the wall. The deputy starts hacking at the stone wall where Belasko completes his transformation. With his transformation complete, Belasko bursts through the wall with brute strength, snarling then snatches Parrish by the neck, lifting him up off his feet, his supernatural eyes glowing lupine blue. The chimera stabs Parrish at once in the side with his talons then draws on Parrish' life-force. The deputy's eyes proceed to glow his fiery red colour. Belasko siphons Parrish's power which turns his eyes the same colour as Parrish's. However, Belasko realizes his siphoning is impeded. He figures out Parrish isn't a werewolf, but is a supernatural. Gloating with a savage grin on his face, he lets the mauled deputy fall to the ground, brandishing his super-powered, glowing talons. Belasko: " Now, you're no ordinary creature, Deputy. But then, neither am I. Not tonight. ... I'll let you live - you answer one question: Where's Scott McCall?!" Jordan: "Never heard of him." Belasko slashes Parrish with his talons and leaves the deputy to die. Belasko tracks Scott by scent to his house. He stalks Melissa McCall who has come home from work, but keeps hidden. He searches the house and sees the note attached to the fridge written by Scott. He reads the note and learns Scott is at the high school. At the high school, Belasko ambushes and attacks Scott and his girlfriend Kira Yukimura. The werewolf and kitsune immediately spring into action and fight back. The mutated werewolf hands the two of them a brutal beating. 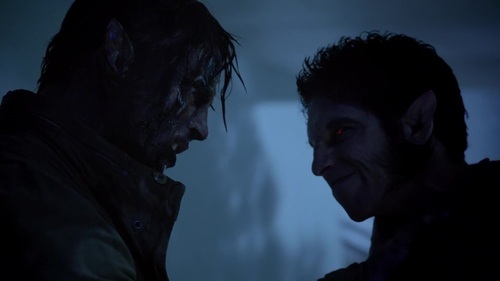 He taunts Scott for his perceived lack of strength, with his being a True Alpha demanding to see his power. 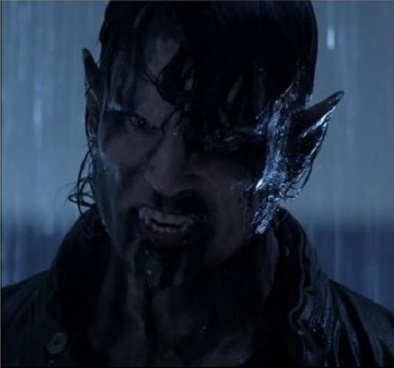 Scott reacts quickly and shapeshifts into his werewolf form, snarling back at the vicious Chimera. Belasko: "A devoted fan. Show me the man who took down Deucalion and broke the Argents. I came for that Alpha. COME ON!!" Scot growls and resumes fighting with Belasko, managing to strike him twice, but Belasko gets the upper hand and throws the Alpha into the wall, then slugs Kira again when she attempts to intercept. He turns around to make his move to take Scott's power. Grinning maniacly, he goes on to gloat the he didn't only come for Scott's Alpha status, fully intending on murdering him. He raises his talons to impale Scott, but is then distracted by the timely intervention of another werewolf Theo Raeken (who, unbeknownst to Belasko, is another of the Dread Doctors' agents with his own agenda). Belasko takes the fight up with Theo, snarling when the unfamiliar Chimera manages to wound him, but he throws Theo aside. Scott gets back up and takes Belasko on again. He fights Scott to a stalemate, but manages to catch the Alpha by the throat. He raises his glowing talons and guts Scott in the stomach, leaving Scott gasping in pain. Belasko gleefully growls in success and soon the talons start to siphon Scott's life-force and power. Scott sinks to the ground as his power is taken. Completely obsessing and indulging in his success, Belasko doesn't acknowledge members of Scott's Pack, Stiles Stilinski, Malia Tate and Liam Dunbar when they arrive on the scene. Suddenly Scott reins in his power and takes it back from Belasko. To Belasko's surprise, the True Alpha gets back on his feet, takes Belasko's arm and twists it, breaking the bones. Belasko roars out in anguish holding his mangled arm while Scott rips the Chimera's separated talons out of his chest. Belasko cradles his arm against his chest and sinks to Scott's feet. Scott: "I don't know who you are or what you thought you were going to do. But I'll give you a choice. You can stay and I'll break something else. Or you can run. Belasko chooses to run, scurrying off into the night. Sometime later Belasko appears in the Dread Doctors' operating theatre. Cradling his mangled arm, Belasko requests another chance to be of service to them and more power from his masters. He waits as the three Doctors manifest and make their way towards him. He panics however when the Surgeon takes out his sword realizing they aren't extending leniency. Terrified, Belasko begs them to wait, then pleads again for another chance and that he's going to be fine. The Doctors point out his injury worsens, remind him he was supposed to eliminate Scott as he and his Pack would be an obstacle to their plans. Panicking, Belasko persists he can help with whatever they are in Beacon Hills for. The Surgeon: "No second chances." Belasko: "I can help you!!" The Pathologist: "No second chances." Belasko begs for his life, but the Surgeon simply raises his rapier/cane and impales the Chimera through his chest. Belasko raspily gasps as he falls on his back and dies in seconds. As his body degenerates, supernatural ravens emerge from the gaping hole in Belasko's chest .